Bengaluru witnessed a special and a very essential awareness campaign this Sunday. 1st December being World AIDS Day, the students of Symbiosis Institute of Business Management (SIBM), Bangalore, along with ActionAid, an international NGO, held a campaign in the city to sensitise Bangaloreans about AIDS and ways to deal with it. The motive was to remove the stigma associated with this dreaded disease which has already raised its ugly head in India, and is spreading rapidly. Forum Mall at Kormangala saw a host of events organised by SIBM and ActionAid. The latter had a display of images of AIDS affected patients along with their life stories. A few HIV positive women from ActionAid present at the site shared their experience of their years of suffering and how they have been fighting it. It was humbling to listen to them and see them fighting AIDS with great courage and determination, with smiles on their face. SIBM students had their own part to play in the campaign. There was music show and street play performances outside the mall by the students, giving strong messages to the general public about the causes and prevention of AIDS. One of the messages that strongly came out was that AIDS could be dealt with by proper nutrition, by following a good lifestyle along with regular doses of medication. Red Ribbons, an international symbol of AIDS awareness and book marks containing messages of AIDS prevention were also distributed in the crowd. The campaign was not restricted to Forum Mall itself. There were huge banners displayed at traffic signals near MG Road and Forum Mall by students giving out messages urging the pedestrians as well as motorist to stand up and face this issue head on. Bangaloreans seemed very curious as well as interested in the whole affair. The response to the event was encouraging. There were people walking up to the stalls and expressing their desire to contribute to the cause in their own little way. Some were helping through charity while others showed genuine interest to be a part of the entire setup and help fight AIDS. The amount of interest this event seemed to generate is a certainly a step in the right direction for Bangalore city to fight this pandemic called AIDS. Note: ActionAid is an international anti-poverty agency operating in over 40 countries, working with poor and marginalised people to end poverty and injustice. Dealing with consumer cases needs sound knowledge of existing laws. 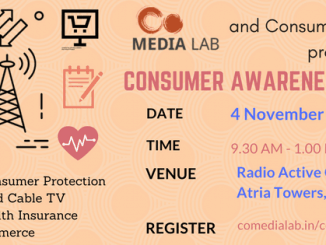 Do attend this event to know more about consumer laws and rules. Private hospitals sell this drug, for Rs 36,000 a dose. Poor HIV-affected can no way afford this. Let’s hope the interest translates to at least a change in atttitudes!